This set of four Padilla Stoneware Tulip Mugs is just one of Padilla's new unique designs. This particular Padilla design now comes in 9 different colors. Notice the stoneware cup design with the Octagon Shape and artistic drip design on the mug. This Padilla Mug Tree Set would make a great addition to anyone's kitchen decor. You can see all Padilla Stoneware Mug Trees designs here Padilla Stoneware Mug Trees. 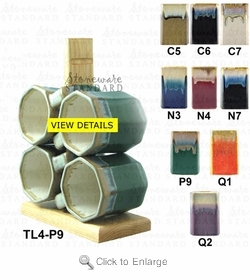 You may order replacement mugs for this set here Padilla Stoneware Tulip Mug. Understand replacement Mugs may vary in color from original mug set. A very durable material, stoneware will last for years while keeping its original beauty. Each piece is fired twice at a high temperature and finished by hand. Minor imperfections are therefore a common characteristic of hand-finished stoneware products. Strict quality control has been established to ensure you the highest quality possible at the best price. There are many factors that determine variations in colors that result from high-fired glazed stoneware, many of which are a challenge to control. Therefore, each piece is unique and there are often variations in color. Only lead-free glazes are used and the product is tested to ensure that there are no traces of either lead or cadmium.